tubular polyester webbing for resistance to UV light and abrasion. Also features double-locking snap hooks at the attachment and anchorage ends. •Internal continuous-length shock absorber limits arresting forces to 900lbs. or less. •Light-weight design makes this an end-user favorite. 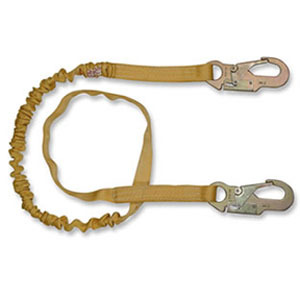 •1-1/4” Tubular webbing has a tensile strength of 6,000lbs. •Meets or exceeds the requirements of OSHA 1926 and ANSI Z359.